As farriers, we have let the horses and the horse world down. With information technology on tap, we are still not getting it right. The over abundance of horses with long toes – low heels, flares, contracted heels and Seedy Toe are ample evidence that things are not right, and that farriers are not correcting these simple problems. And I am not just talking about Australia, as these problems are world-wide. The reason the farriers are not correcting these problems is they don’t know how to, and the reason they don’t know how to is that they have not been taught correctly. The farriers working for the Sultan of Brunei, or for the Hong Kong Turf Club no doubt do an excellent job, as do the top few percent of any trade. But these farriers are an elite group and do not travel around shoeing kids’ ponies and enthusiasts’ pleasure horses. This leaves the stable door open for newcomers to arrive waving their Magic Fixit Flags. So firstly in came the barefoot trimmers, with a ‘new’ invention, the barefoot horse. And the horse owners listened because their horses were lame and had so many problems. And if your horse is dead lame, anything is going to be an improvement. Hot on their heels has followed an influx of Magic Fixit Horseshoes. There are clip on shoes, so you don’t even need to bother with tedious work such as trimming. There are plastic shoes, so thick that the frog has no chance of ever touching the ground and doing what it should. 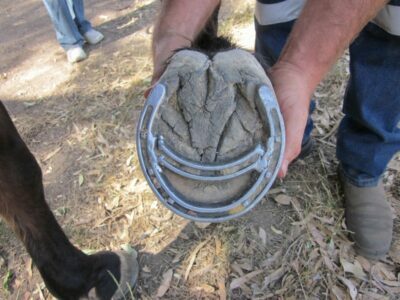 There are also Magic Fixit horseshoes with a vastly shortened toe, so that the horse can go 10-12 weeks between shoeing. If the horse was meant to have a square toe, surely it would have a square coronary band, but it doesn’t. When square toed shoes have been on the hoof for that length of time, the actual profile of the hoof has grown out past the shoe and become round again, defying the efforts of the square toed shoe fitter to keep it blunt, supposedly to assist in breakover movement. However, the initial application of square toed shoes to a horse suffering long toe/low heel syndrome is to give it immediate relief in the short term, giving the owner satisfaction that they have done the right thing. Again, if the farriers had been correctly balancing the hooves, the need for change would never have been necessary. However, any method which alters the natural balance of the hoof will also alter the gait of the horse, and is merely a temporary bandaid which will have a long term cost to the soundness of the horse. A caller asked me to see a lame pony recently. The pony had size 00 hooves and had been shod in these Magic Fixit shoes, which weighed 310 grams per shoe, compared to 130 grams per shoe for a regular shoe – 720gm more than the weight of four standard shoes. The pony had stress foundered a few days later. I will gladly accept a challenge from anyone promoting any of these crazy Magic Fixit shoes and who are suggesting that they can remedy lameness. My experience is that 99% of hoof lameness problems can be corrected simply by correctly balancing the hoof and if necessary applying standard shoes, and I will gladly debate or demonstrate this against any Magic Fixit shoe. But most importantly, ALL people who are working with horses hooves need to be correctly educated in the simple basic principles of hoof balance, and that includes teachers of farriers, farriers, barefoot trimmers and horseshoe promoters. The astute horse rider recognises instantly the difference between a well shod horse and a horse shod with bandaids. Surely we should listen to them and be accountable. Farriers shoe horses, so what else do they have to learn or need to learn? They learnt their trade once, so isn’t that enough to get them through to retirement? It is a physical and tiring job and they already earn a living, so should they waste precious time and money going to association meetings? But where are all these skilled farriers, and how can horse owners find satisfactory answers to their problems? 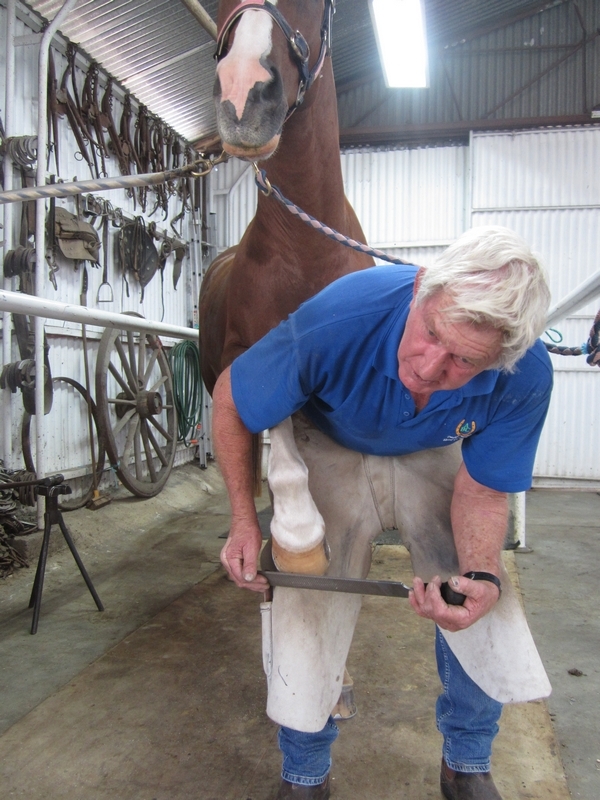 In Australia we have two main farrier associations to cover the needs of our population. Some states are not even part of these two associations, and have their own. In America, (with a population 15 times that of Australia) there are also two main associations, and another two or more smaller associations and there has been enormous discord, faction fighting and unrest over the past three years because of it. And why does Australia need two associations anyway? I assume it is a male thing for the struggle for power, just like war, and the logic for doing so becomes irrelevant, also just like war. Most farrier associations seem to be preoccupied with blacksmithing, and while the notion of hammering steel is an attractive one, is blacksmithing a major part of farriery today? The horseshoe manufacturers spend millions of dollars in creating shoes that can be fitted to the horse with a minimum of alteration. If a horse is correctly balanced, if the flares are removed, if the hoof has been correctly maintained so that hoof problems (like Seedy Toe, contracted heels, Navicular Syndrome, brushing, forging, over-reaching) do not arise, then hand made shoes are rarely if ever required. I believe the real issues and the solution to the problems in the farrier industries lie with the HORSE OWNER. All the horses we farriers trim or shoe belong to a horse owner or trainer, and these people are crying out for information. They are also turning to alternative methods of trimming, most of which are very dubious in their application, but are sold by well meaning, caring horse lovers who themselves have either become disenchanted with the farrier, or have seen a financial window of opportunity (or have paid for one) which has fast become a major hole in the dam for farriers. 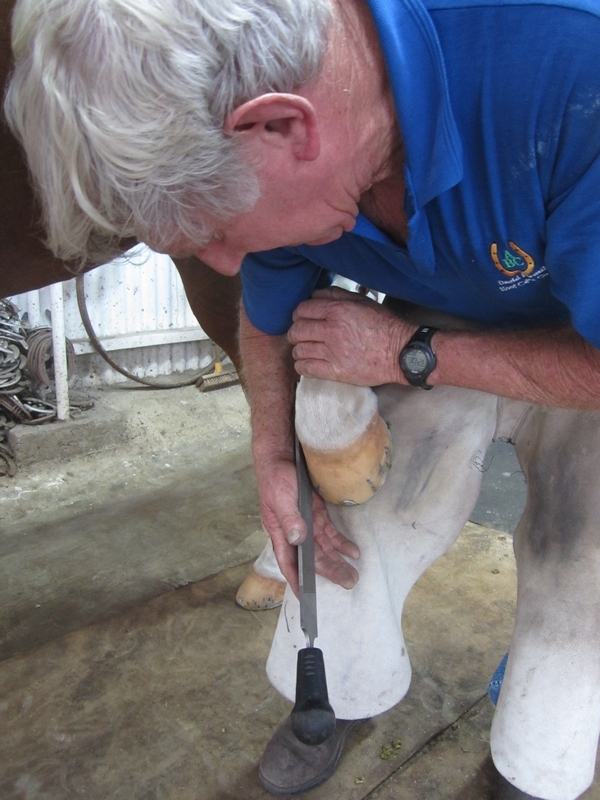 IF the horse owners are questioning the farriers, expressing concerns about hoof problems, or commenting on gait problems then they are doing this for a good reason – they are concerned at the well-being or performance of the horse. And I believe they have every right to express their concerns. But why is it that farriers generally won’t accept instructions, criticism of their work, or listen to new methods or ideas? I have a large website which welcomes queries from horse owners, and I have accumulated nine folders of queries over the past four years. Each folder holds one ream of paper; each ream is 550 sheets so that’s around 5000 queries. The queries range from the very straightforward to the extremely unusual. But about 90% of queries express a concern about the attitude and/or ability of the farrier. This is more than enough to make me sit up and think that we as farriers HAVE to listen to the horse owner, that we HAVE to ask ourselves if we can do better, and we HAVE to ask how we can improve the relationship between ourselves and the horse owner. 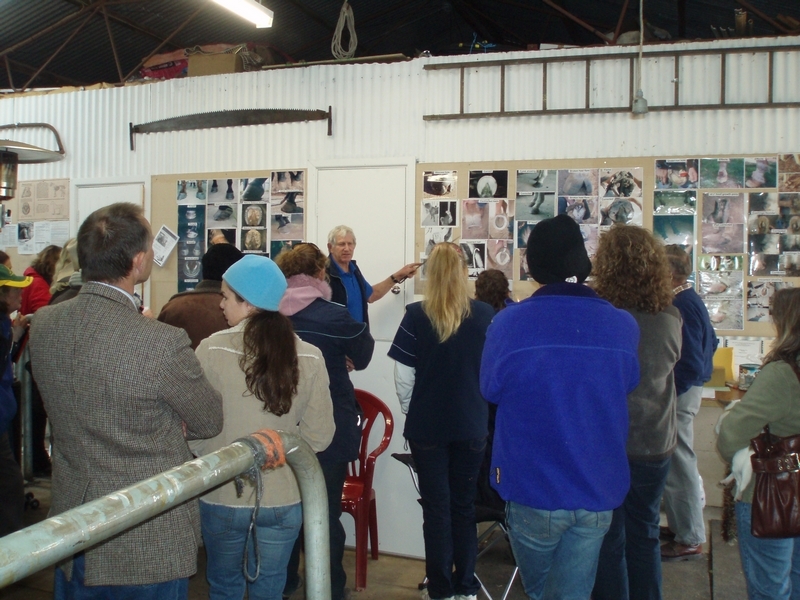 I believe that a good start would be for all farriers associations to initiate workshops where owners can bring a horse with hoof issues along to the workshop, and a group of farriers will discuss the problems and work towards a resolution. In the mind of some, this is called sticking your head up to get shot at. But if farriers all know everything there is to know about hoof problems, then they won’t have any problem in identifying these problems, and the farriers who don’t know it all will benefit from seeing these problems identified. And hopefully it will be building a small bridge to start better communication with the horse owner. Because I flaunt my mobile phone number and my email address so freely, I receive a lot of phone calls and a lot of emails. Invariably I am either under a horse, running a course, or out of range in the outback, but I make a point of ringing every caller back as soon as I can and I check my emails daily. Leaving a mobile phone on for 24 hours a day has its disadvantages when travelling – I am often woken around 5am by my mobile phone, when unwittingly someone from the eastern states has rung me not realising that I am currently travelling in Western Australia which is two hours behind their time. I had an email last week from a woman who hoped I would be able to tell her the quietest stock horse stallion in Australia suitable for her mare. I am flattered that people think I know every horse in Australia, but I really don’t. I receive a huge number of calls and emails from people asking me to recommend a ‘good farrier’ in their area. In actual fact, I don’t meet a lot of farriers. 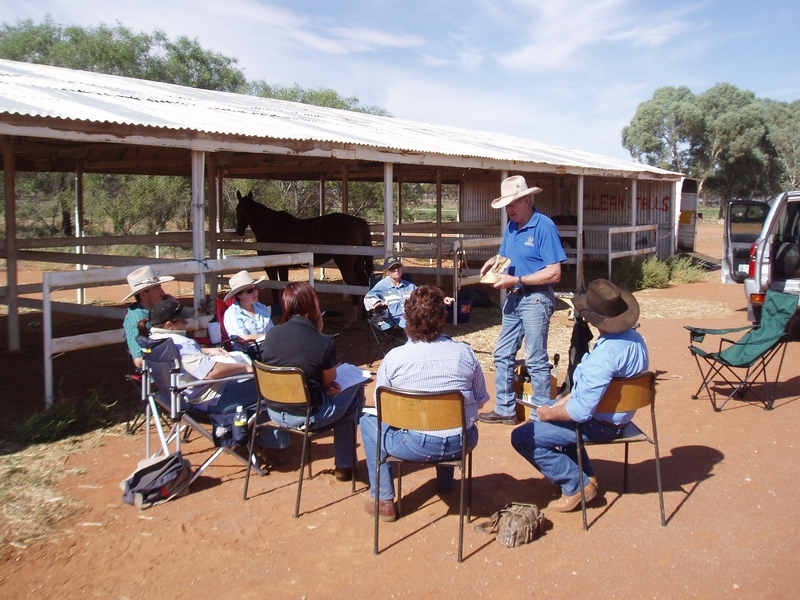 I run year round courses for horse owners, particularly in the outback where there are no farriers. But I really can’t help when I am asked to recommend a farrier. I suggest to callers that they contact their State Master Farriers Association or the Australian Farriers & Blacksmiths Association for a list of farriers. Or their local farrier supply outlet. Then I get another call – they can’t find a number for the MFA or the AFBA. Finding a number for an association is not as straightforward as you may think. I can’t find anything under Associations either. So I suggest they should look in the yellow pages under Blacksmiths & Farriers. Not there either, although there is quite a listing of farriers which may be of help to those searching for a farrier. In QLD the Professional Farriers and Blacksmiths Association of Queensland (PFBAQ) was born via the merger of the Australian Farriers and Blacksmiths Association Queensland (AFBAQ) and the Queensland Master Farriers Association (QMFA). 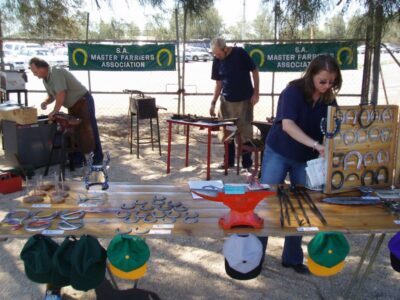 Various websites have listings of farriers, blacksmiths, farrier supplies and associations. The WAFA association in WA is on Facebook. That raised the question of what is the difference between a blacksmith and a farrier. I get a lot of calls from people wanting gates made, crowbars sharpened, fancy ironwork made and so forth. So back to the Blacksmiths and Farriers listing in the yellow pages to find them a blacksmith. I find it very sad that people in other states contact me knowing that I answer my phone, when the people they should be contacting in their own state are not answering their phones or are unavailable or just unable to be found. 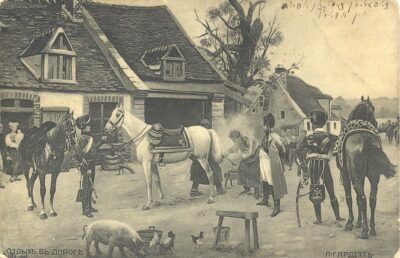 While trawling around the internet, I found this wonderful drawing; so even Napoleon had to wait for the farrier. I keep on having the same old recurring discussion with desperate horse owners, not only here in Australia but from quite a few other countries overseas. 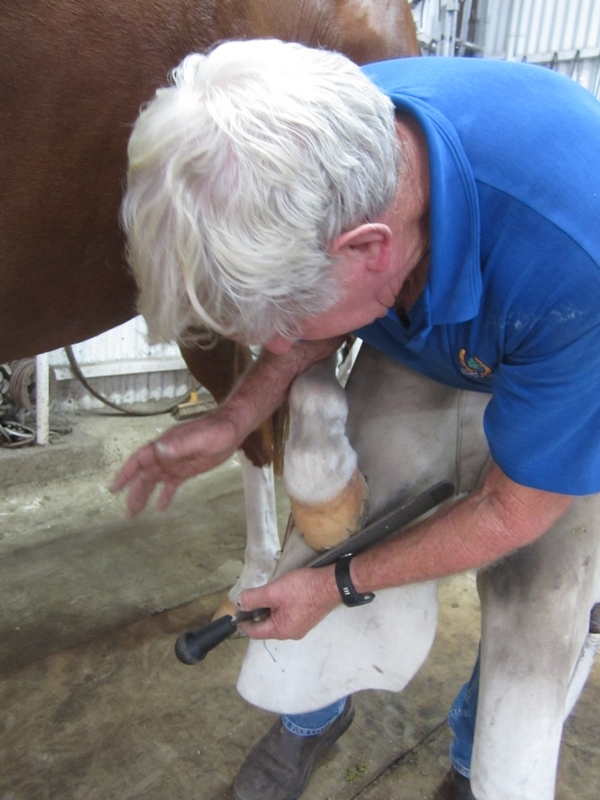 These owners have generally started via the internet in their search for answers to an ongoing lameness issue, which up to this point has caused them to employ the services of a succession of farriers using many and varied methods of hoof care, with no resolution of their problems. They are just looking for help. They contact me because I have a website and answer emails. They might be in Singapore or South Africa, in USA or in Australia or even just around the corner. But their horse has a hoof problem and they just want that problem resolved. It should simply be a matter of calling a qualified tradesman farrier to do his or her job and trusting them to be correct, but in reality it is not quite that simple. In any trade or profession, historically, there are those who are truly adept at their work – they are problem solvers and they understand the need to continually research and study to maintain their expertise. It doesn’t matter if we talk about a car mechanic or a surgeon or a cook – there are those who excel at it, those who are OK at it, and those who probably should never have been there in the first place. In England there are strict regulations put in place by government and animal welfare organizations to control the standards of work performed by farriers on horses but it is one of the only countries where this is in force. Elsewhere there are no laws to protect our horses and their owners from the effects of untrained guesswork carried out by people just trying to earn a living, and even worse they never seem to be held accountable for the real cost of the lameness that this is causing because there is no legal obligation requiring them to be accountable. And it seems that while many people will refuse to pay for shoddy workmanship for just about anything else, they still pay the farrier for poor workmanship or a lame horse and then complain to anyone who will listen to them. 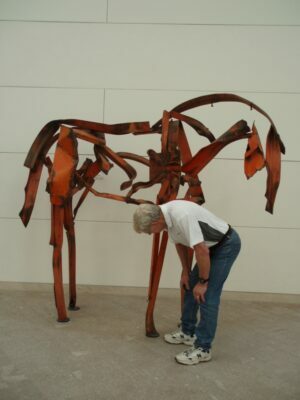 In Australia the farriery industry is unregulated – anyone can call themselves a farrier, anyone can join a Farriers Association without certification, and there is no requirement other than personal motivation for a farrier to do the Certificate Three in Farriery, although some states require certification for a racetrack farrier. At this stage the Certificate Three in Farriery is actually categorised under the metal trades award. In an ideal world the equine industry would insist on a regulated trade for all hoof carers. Farrier associations in all states are doing their best to educate and train people to the correct standards and encourage their trade accreditation, but those numbers are in the minority compared to the numbers of people practicing hoof care, so you can begin to see why the standards of work are extremely varied. Even trade accreditation falls short of its intended long term purpose because the holder of such a certificate is under no obligation to continue to study or upgrade their skills ever again. 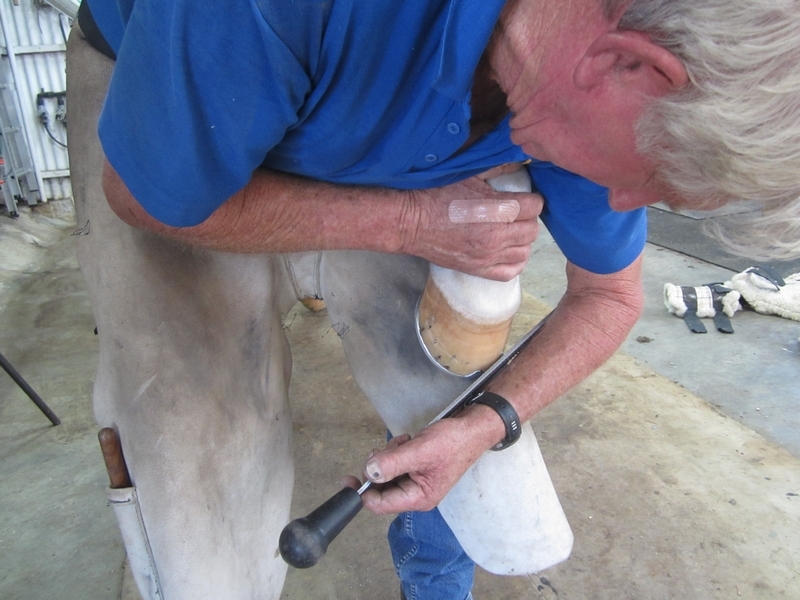 By necessity most farriers work alone and can very easily develop habits in order to save time, often resulting in less than accurate work which they are often unaware of, even if lameness appears. 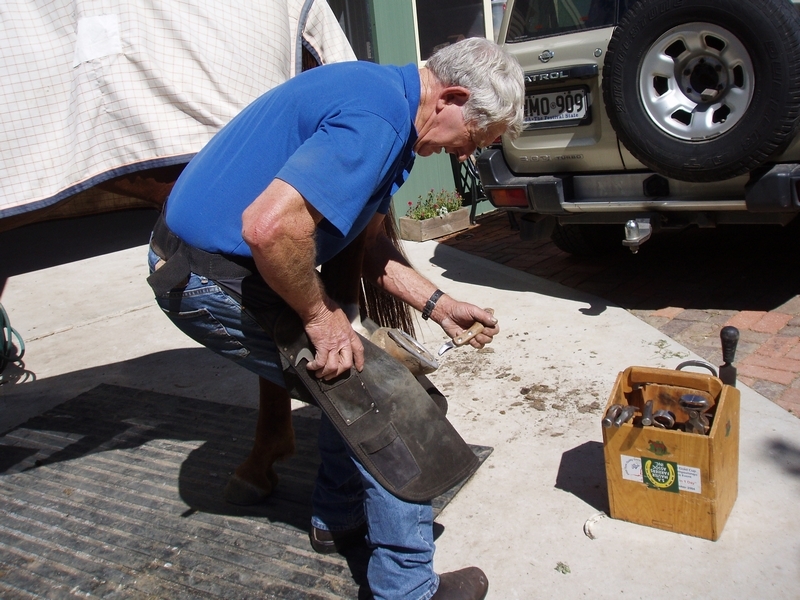 There are many and varied views as to what is correct or incorrect when it comes to trimming or shoeing a horse. Soundness and performance are the best guidelines when judging whether the work is right or wrong; regardless of whether or not the person was accredited, if they are doing it right it is because they know their trade and they do understand the hoof and are passionate about horses. We can all recall horses which could have been brilliant but for the want of having good hooves have never reached their full potential. It is still within our power to put things right in the hoof care industry and put pressure on government and other bodies to legislate and control work practices to our partners on this planet, the horses. I do believe that it is never too late to make a stand and make a start. The horse owner has the real power as they control the purse strings. You, the horse owner, can demand and ultimately achieve what you want and in defence of your horses you have to make the moves and perhaps contact the AHIC or whichever body you feel is best suited to get the ball rolling for improvement to regulate the hoof care industry. Collectively, all horse associations and clubs would be a strong force of persuasion, and I am sure that no politicians have forgotten the stock horses at the opening of the Sydney Olympic Games, but they probably didn’t understand the importance of those horses having properly maintained feet, or the importance of those responsible for that hoof care. As a young chap learning the trade I can never remember any of my older mentors displaying the attitude that they knew all there was to know about shoeing horses. If the horse had any gait or attitude problems which caused the farrier to take twice as long to complete the job, the fee didn’t alter, because he was confident that any extra effort put in now would make the job much easier next time around. It should be a matter of pride coupled with expertise that you do whatever it takes to successfully complete the task, without expecting the client to pay you extra for the privilege you have just had to practise something new and learn more. However what seems to be happening in the horse shoeing industry today is of great concern to the truly qualified tradesman and to the exasperation, dismay and despair of more and more horse owners. Farriery today it is looked upon as a very lucrative industry and sadly (for the horse) it is money motivated, increasingly infected with buzz words and a myriad of alternative new age horse shoes and methods of preparation and application. It is obvious that we must have young people continuing to learn the art of farriery. In past times it was easy to teach and to learn the simple art of the trade; it was an uncomplicated and simple trade and so the standard was more consistent and for the horse owner a more consistent outcome was assured. Even today I will not attempt to teach someone who wants to become a farrier unless they are already a competent rider so they can emotionalise and feel the effects of what they do as a farrier to impact on the performance of the horse. I hear constantly from totally confused owners who have just had their sound horse shod or trimmed and sometimes they have been charged hundreds of dollars by the farrier and their horse is now unsound. Those I can not see in person I do see via email photos in colour and the problem is always the same – misdiagnosis of the needs of the horse’s hoof and the expectations of the owner. 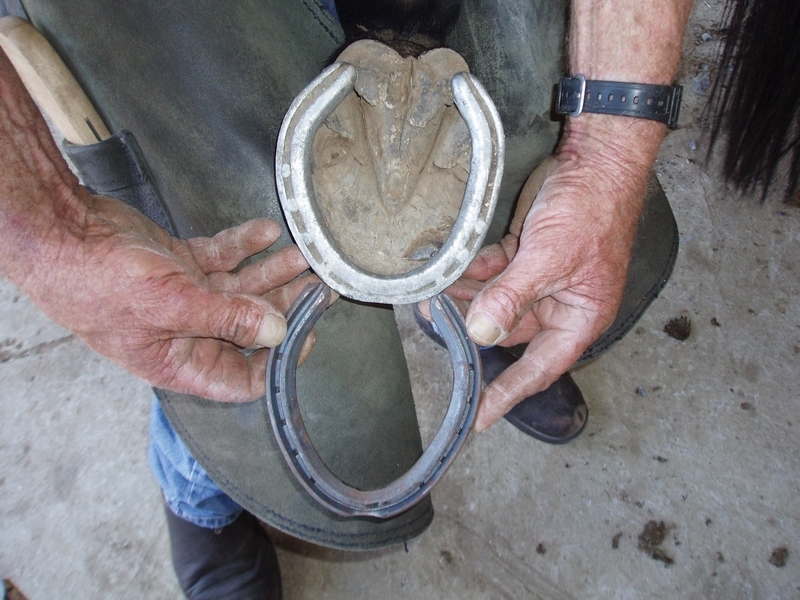 The farrier (and I use the term loosely in these cases) has not assessed the horse correctly or has not had the proper basic training to correctly trim the hoof be it unshod or shod; as a result if shoes are required he has fitted totally the wrong size, weight and shape and then used wrong nails to complete the disaster. One such horse I was asked to look at had been shod (with standard concave shoes) just the previous week by a ‘specialist in corrective farriery’, at a cost of $350. The owner was told it would take several visits to correct the problem of sidebone (a bony swelling above the coronary band) and thrush infection in the frogs, hence the cost because it had to be shod ‘in a special way’. Also, the horse was ‘not to be worked for another three months’. Firstly, there is no such thing as a ‘specialist in corrective farriery’. You will never find a horse with four perfect feet, so it is the job of every farrier to correctly balance and trim the feet in order to correctly shoe the horse if required. Secondly, the average fee to shoe a horse with standard shoes is around the $100+ mark and varying from state to state. So what justifies a fee of $350? Ego! On my inspection, the horse with the $350 shoes walked very crookedly with every leg swinging in a different pattern; viewed from in front he was standing splay footed, and from behind he was cow hocked. A closer inspection underneath showed that not one hoof was trimmed in balance and that this unevenness was now causing more pressure above the coronary band where the suspected side bone was supposed to be, while the thrush had already cleared up. This lovely horse was anything but comfortable on his feet yet only needed to be shod with proper balance to relieve his pain; he did not have any side bone in the first place, just swelling from being out of balance. I dearly wanted to reshoe this horse correctly so that he would be pain free and could be worked next day. However, I chose not to help this horse as I believe the owner has a legal right to compensation from this ill-qualified horse shoer. You as a horse owner have every right to ask for proof of ability, client references and trade qualifications before anyone works on your horse’s feet. Try it, and if you get a negative response, that should sound enough warning bells not to go there. The best farrier you may find (by asking for prior references etc) will not have an ego which is going to cost you dearly, he may not even be fully accredited yet, but he should be working with an accredited mentor and be willing to listen to your input as an owner or rider. For thousands of years the horse’s hoof has remained the same and in domesticated use has only needed to be shod or unshod. Now in our modern society we have the benefit of modern methods to gain a better understanding of the hoof, but it is still exactly the same hoof. Our selfish needs require our horses to do many more varied activities now but we still only need our horse to be shod or unshod. The simple basic principles of hoof care are still correct and will not ever alter, so be aware as horse owners that if we try to disregard the basic principles of balance and use some of the alternatives infecting the horse world today, the long term soundness of the horse may be affected. It is only my opinion but I sincerely believe that buzz words and egos will cost you and your horse dearly. A few weeks ago I had a call from a young farrier who had relocated from USA and was finding it difficult to get work in South Australia. I have a standard master file of replies for email queries from farriers considering relocating from overseas, ranging from locations, hoof care charges in different states, how to get started, who to contact, weather conditions, travel distances, petrol prices, schools, immigration rules, visas and so on, so I invited him to spend a morning with me. I work in an area which could use more good farriers and where hoof care on pleasure horses is always available – because of travel and health reasons I have given away my clientele several times over the past 20 years, but it builds up again as fast as ever. During the four hours I was with the young farrier, I found out that he used side clipped steel shoes plus under-pads with sole pack material on most horses, in other cases he used plastic shoes and that he charged $200 per set and was not prepared to change his methods or reduce his price and that he had been living in Australia for three months and had not shod a horse. In those four hours he did not ask me one question; he was set in his ways and I guess he thought the work was magically going to appear at his doorstep. That afternoon, working by myself again, I saw a lovely big 16 hand chestnut gelding standing ready to be reshod; he had a very kind eye and a good disposition but was standing splayed out in front and cow hocked behind. The front shoes were of the break-over enhanced design with squared toes and savagely belted in side clips, the nail placement was one directly each side of the clips and a gap to a third one behind that. 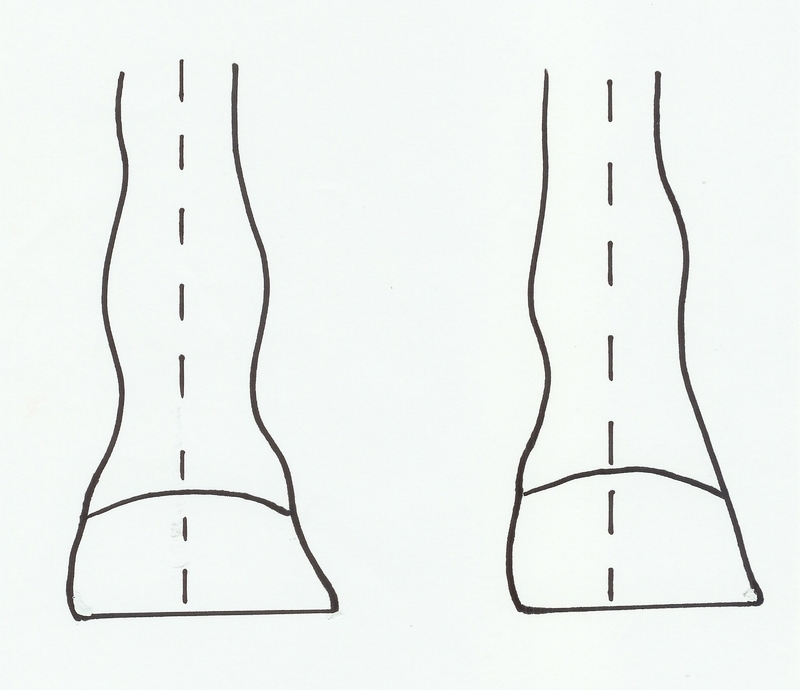 The hind shoes were squared toed and side clipped with an outside trailer at the heel, a guaranteed design to make sure the horse cannot stand straight. I engaged the well-presented young farrier in a pleasant conversation about shoeing. I asked why he preferred to use the squared toe side clipped shoe with the rolled toe. He explained that the horse was a good show jumper and the shorter toe shoe lessened the impact; I then asked if he was at all concerned that these side clips might restrict expansion across the front half of the hoof, and he explained (while we both looked at the shiny wear on the hoof side of the shoe he had just removed), that the hoof had only been expanding at the heels, and that there was no evidence of the hoof expanding across the front half. I asked him if he thought the side clips may have stopped this expansion, his answer was ‘they help keep the shoe in place’. All of his answers sounded feasible, but all were unsustainable with regard to the long term health and soundness of the horse. Even when I pointed to the two bulges in the coronary band directly above the two side clips, he regarded these bulges as being normal; through experience I have learned that these bulges simply disappear when we don’t use side clipped shoes. So he then prepped the fronts for reshoeing which looked quite nice until those side clips were buried back into the walls to allow the shoe to be set way back behind the toe, which was then bull-nosed off to the rolled toe shoe; this also set the shoe wide at the heels and hanging out the back forming a leverage point. Then he moved on to the hinds with the toes pointing out, or cow-hocked, and the shoes with square toes and side clips plus an outside heel extension, or trailer as it is sometimes known. 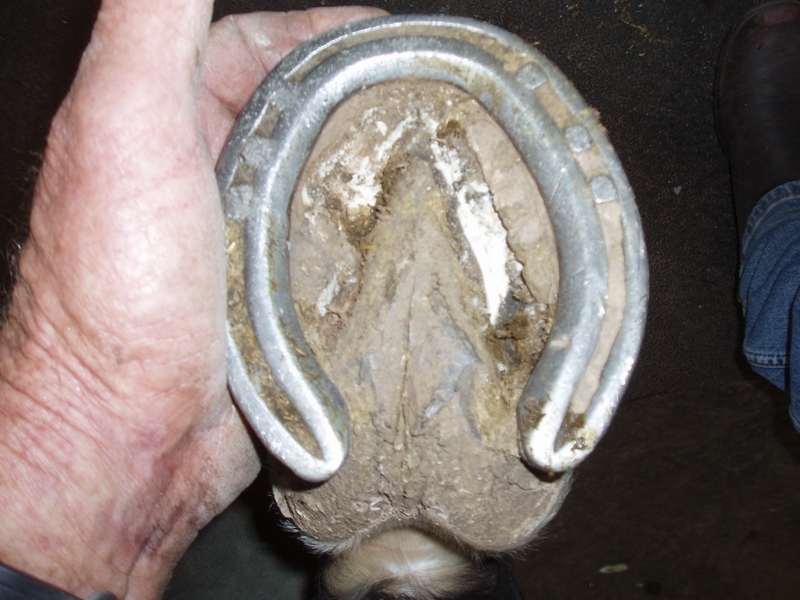 According to the young farrier, the reason for the side clips was to prevent the shoe from moving when the jumping studs were used and the squared toe was to assist the breakover, while the lateral trailer, or outside heel extension, helps the horse to stand wider behind. “But they also cause him to toe out” I said. “Most horses stand cow hocked, so it must be OK,” he replied. I have shod eventers and jumpers all my life and have never had the need to use anything but a single toe clip on a concave shoe even with jumping studs fitted to keep a shoe in place. The reality is that Mother Nature evolved the hoof to be in a balanced or symmetrical shape to assist the horses flight response; hence the fore feet are round (to carry the heavier weight of the front end) and the hinds are narrower along the sides (to assist the horse in turning sideways to escape its predators) and with a narrow toe to assist the horse to accelerate away from those predators. It seems that the modern hoof care provider believes that the horses hoof is so defective that it needs to be interpreted in a very different way than ever before, however the simple basic principles of nature’s hoof balance have never changed; we just need to see what we are looking at. My last call of that day was to an owner who had serious lameness issues with her horse. I was quite stunned when I viewed the horse, which was shod with the most amazing shoes I have ever seen. 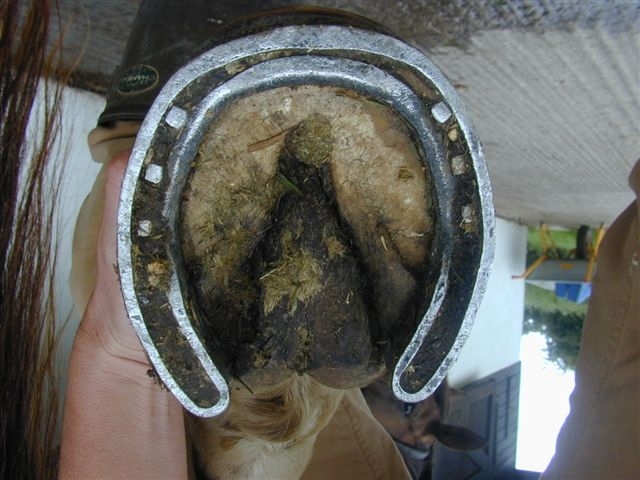 (Pic 1) All the horse needed was to have the soles dressed out correctly so the horse could stand on the hoof wall and after this was done the horse was fine and had no lameness issues. Instead the farrier had made these crazy shoes and insisted that the owner clean out the dirt build-up four times daily. That night I rang the farrier concerned and asked why he had shod the horse with those shoes. The answer was ‘for support’ so I asked ‘to support what?’ His answer was ‘If you don’t know then I’m not going to tell you’ which unfortunately is a typical answer from farriers who don’t have any scientific basis for what they are doing. He had no idea where P3 was in relation to his bar shoes and no understanding of how the hoof expands and contracts and no understanding that he was actually causing pain for the horse. So that was a wasted day, but then tomorrow is another day. 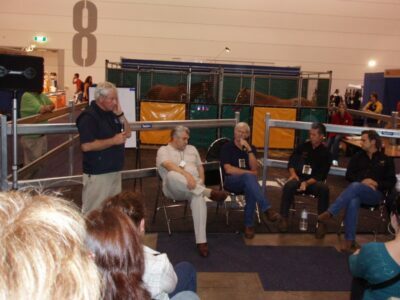 One of the sessions at Equitana 2005 in Melbourne in November was an open discussion on ‘To Shoe or Not to Shoe’. Panelists were Carl O’Dwyer, Grant Moon, David Farmilo, Will Miller, Dan Guerrera and Mark Rodney. The discussion was well attended considering it was the last segment on the final day, starting at 5.15pm. The audience had the opportunity to question the panel and it would probably still be going if Equitana hadn’t closed its doors! In summary, horse owners obviously have an ever increasing problem with farrier related problems. I made the comment that horse owners have a duty of care to their horse when it comes to hoof care, and I was very promptly put in my place with the audience demanding to know just how they can get their farriers to listen to what they want. One member of the audience labelled farriers as ‘precious’ due to their reluctance and affront at having the owner daring to make suggestions. Owners who intervene are being told to ‘shoe it yourself’ or ‘get someone else then if you don’t like the way I do it’. This attitude was not confined to one state or even to Australia judging by the comments! Owners who have tried to trim or shoe and who find it too difficult to ‘do it themselves’ are then out on a limb. Country people dare not challenge their farrier as he is often the only one available. I do believe that this attitude is what is causing the major problems in our farrier industry today. Nowadays most people are answerable in their jobs, and horse owners have the right to discuss with and demand from their farrier what result they expect from him and from the horse. 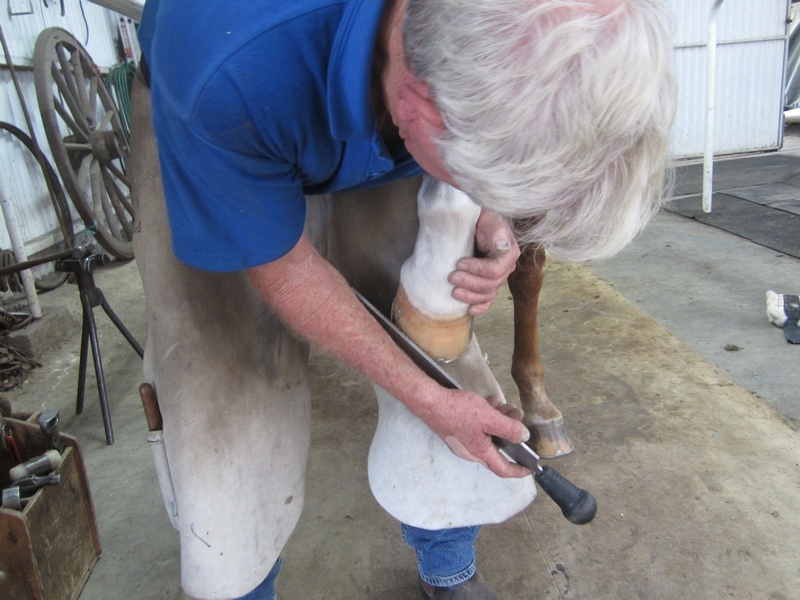 The reluctance of many farriers to involve the owner and discuss with them what they are doing, and also to be prepared to listen and learn has led to alternative and controversial methods of hoof care creeping into the system. Also creeping in are new fangled horse shoes that bypass the simple basic principles of horseshoeing and create long term problems for the horse. This should be a huge wake up call to the whole farrier industry world wide to sit up, take notice, listen, learn and to be aware that horse owners are intelligent people who outlay a lot of money on their horses and who have the right to expect the best knowledge and care available. Nowadays with the internet on hand, immediate information is available to horse owners world wide, and farriers who do not keep up with this information and who object to being questioned by the horse owner have no-one to blame but themselves. I began teaching my ABC Hoof Care Courses for horse owners six years ago because of the same old complaints from horse owners that their farrier would not listen. 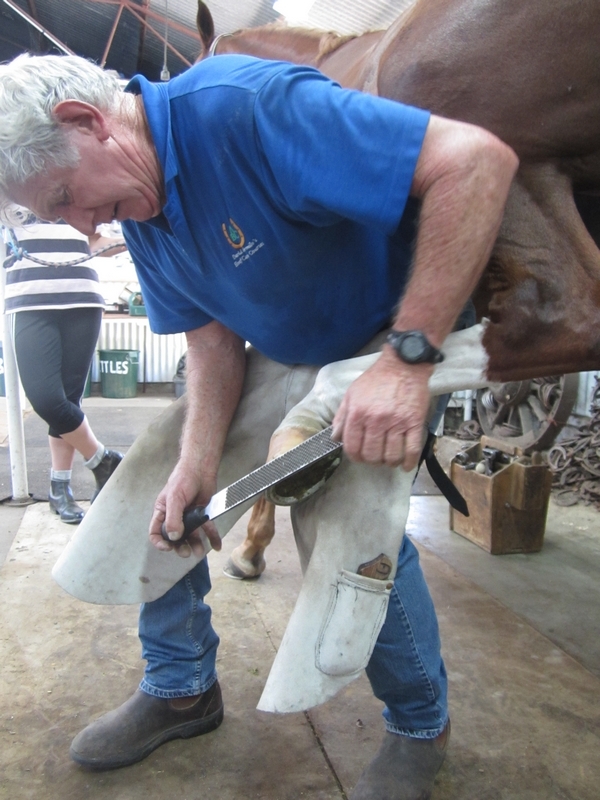 I have taught horse owners across Australia who are now doing a better job than many farriers. But I do humbly take the point that was made by a participant in the discussion that not all horse owners can do this. And this is where it has to go back to the farriers to swallow their pride and be accountable for their results just like the rest of us who live in the real world.